Find upcoming and past events sponsored by Tails in the City. Pictures with Santa December 3rd and 4th at Tails in the City. Don't miss our most popular event of the year! 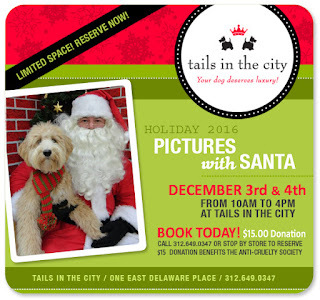 Santa will be visiting Tails in the City for 2 days only. Santa will be at our pet boutique located at One East Delaware Place on Saturday and Sunday Dec. 3rd and 4th from 10:00 am until 4:00 pm. Please call or stop by Tails in the City pet boutique in downtown Chicago to make your appointment for a picture with Santa. Pictures are $15 and proceeds benefit The Anti-Cruelty Society. Please call 312-649-0347 to schedule your appointment. Space is limited!